A spinal column with fused vertebrae. The bones of a woman with advanced syphilis. Skeletons deformed by rickets and leprosy. A fascinating online library of deformed bones from the Middle Ages goes live today—and while I didn't even realize such a thing existed, now I can't imagine living without it. God bless technology. The Digital Diseases website is run by the Royal College of Surgeons in London. It brings together 3D scans of over 1,600 bone specimens taken from patients with debilitating and disfiguring conditions like rickets and leprosy, and makes them free for the public to browse. Bored on a Monday morning? Gawk at this deformed spinal column or marvel at this alien-like skull with an enlarged cranium. In the scientists' own words, "it does not resemble any known hominid species." Cool! 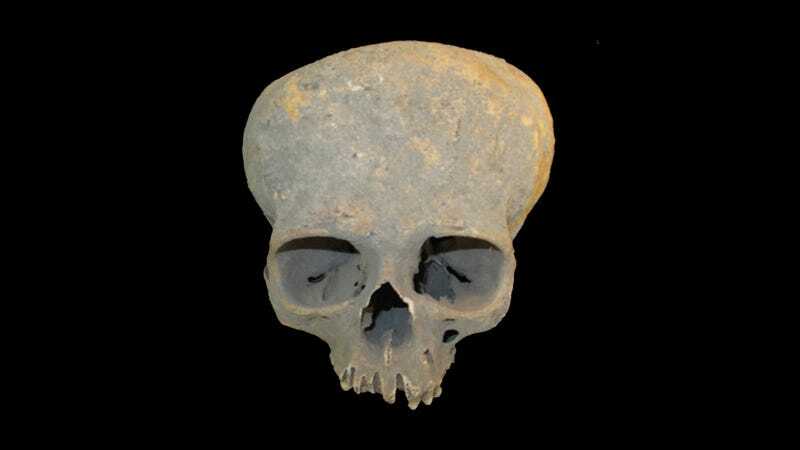 This skull from Chichester shows some unusual endocranial bone changes with various levels of destruction. Macabre as the subject matter may seem at times, the Digital Diseases library represents an impressive marriage of science and technology. Those behind the project used a combination of 3D laser scanning, CT scans and high resolution photography to digitize the specimens. And so while access to these bones was previously only available to students and researchers who could travel to the collection and handle the fragile items, the new database is free for the curious public to explore. This fused spinal column from York is a superb example of advanced ankylosing spondylitis. Note how difficult it is to discern the individual vertebrae.